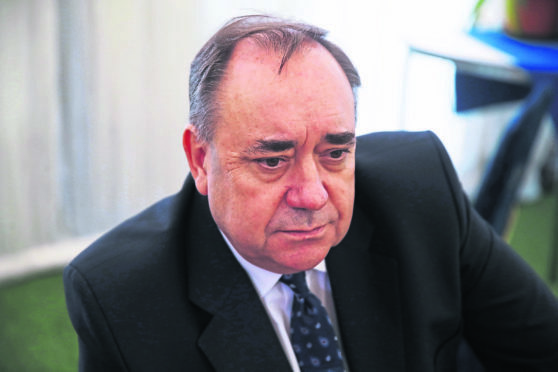 A police probe into allegations of sexual misconduct against Alex Salmond will span a 20 month period of his career, it emerged yesterday. Officers are investigating after claims surfaced relating to Mr Salmond’s time serving as the first minister of Scotland. The force has asked the Scottish Government for the names and contact details of his private office staff between April 2013 and 2014, the Sunday Herald revealed yesterday. The probe includes the period during the independence referendum. It was revealed last month that two Government staff members had made sexual harassment claims against Salmond while he was in office. In one of the cases, a woman accused him of multiple instances of harassment and unwanted sexual advances when he was leader of the Scottish National Party. She alleged that Salmond instructed her to move from a public room in his Bute House residence to his bedroom, where she said he kissed her and touched her sexually. The former first minister denies any wrongdoing and has rejected any of criminality in his behaviour. Last month the former Gordon MP resigned from the SNP to avoid “internal division” within the party if First Minister Nicola Sturgeon bowed to political pressure to suspend his membership. After the allegations made against him were investigated by the Scottish Government – a probe led by permanent secretary Leslie Evans – the findings were referred to Police Scotland. The police carried out a preliminary assessment of the material which last week advanced to an investigation. According to the Sunday Herald, police have now asked the government for information about Salmond’s former staffers, including politically-neutral civil servants in his private office and special advisers. In a communication from a senior figure in the Government human relations team, recipients were told the police had made a request for data including their names, addresses and contact details. The dates covered are from April 1, 2013 to November the following year. November 2014 was Salmond’s final month in office, while April 2013 was months before the Scottish government launched its official white paper on independence.